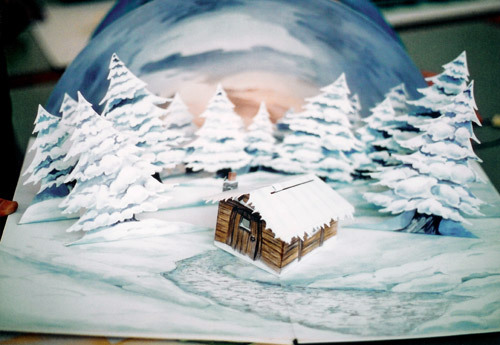 James was part of a small team designing and making a fairytale popup book read by Sir Patrick Stewart for their Christmas TV commercial. The book was constructed from scratch to convey scenes from fairytales in which well known people portrayed some of the characters in the book. 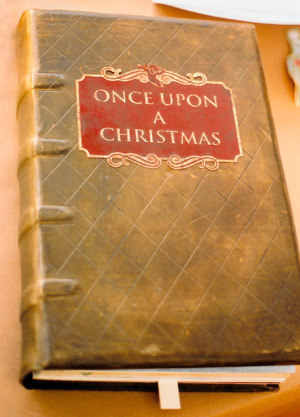 The book had traditional pop up features with paper mechanical levers and tabs, the Christmas tree at the end of the book was lit with fibre optics. 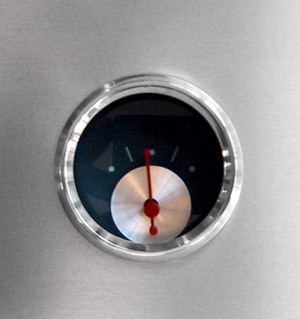 In the Little Red Riding Hood page, James also designed the wolf mechanism as a separate free standing element consequently it was made out of thin sheets of brass to give it strength and to facilitate mechanical pivot points to achieve the movements that were required for the performance. The paper artwork was then applied to the brass mechanism that could be puppeteered from the side out of camera shot. 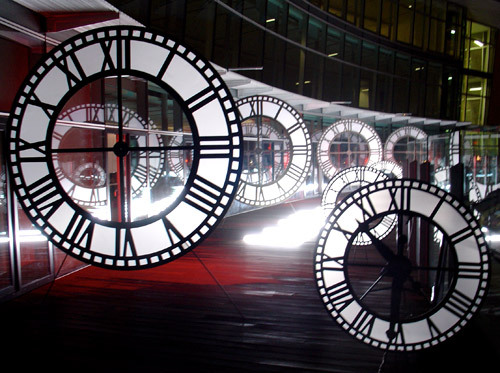 James was part of a small team designing and making three dimensional words which were wrapped as parcels and big clocks to show parcels being delivered on time for their TV commercial. James was part of a small team designing and making products in miniature as Christmas tree decorations for their TV commercial. 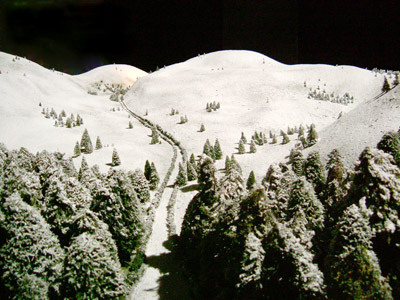 James was part of a team designing and making a large model set of a snowy winter landscape and rigs for their Christmas TV commercial. 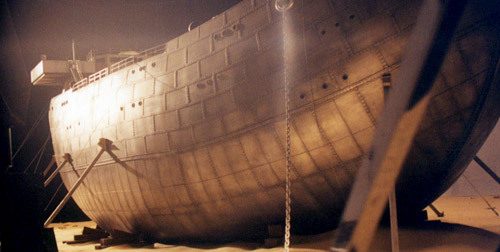 James was part of a team designing and making a 16ft tall building covered in scaffolding which sets sail and then sails away into the distance for their TV commercial. James was part of a small team designing and making a life size exploding man and effects for their TV commercial. 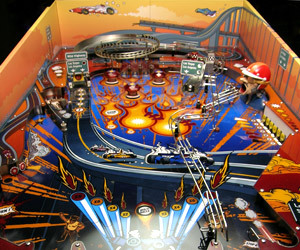 James was part of a small team designing and making a pinball machine model sets for their TV commercial. The Ford Fiesta and passengers was shot around the board instead of a ball, encountering many obstacles along the way and surviving them all. 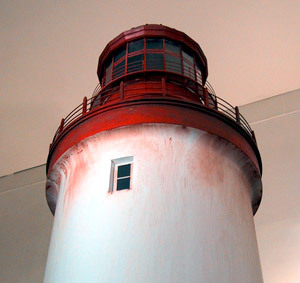 James was part of a small team designing and making an 8ft tall lighthouse model with working light and props for their TV commercial. 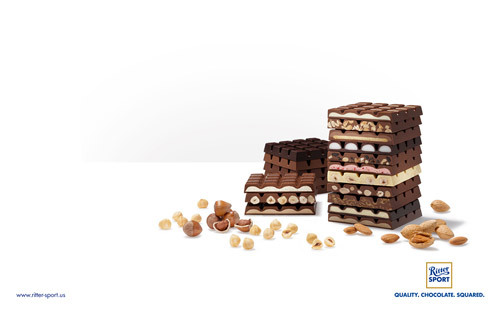 James was part of a small team designing and making chocolate models and liquid effects for their TV commercial. 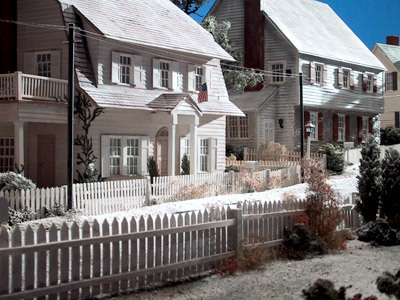 James was part of a team designing and making a 12th scale model set of a typical New England street with clapboard wooden houses for their detergent TV commercial. The houses were all different and had internal illumination and street lights for a night time shot. 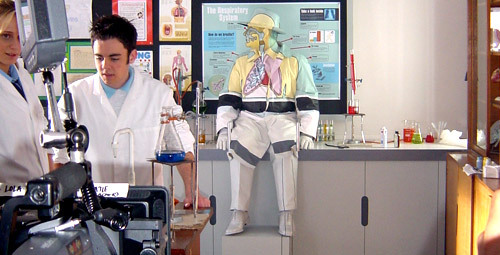 James was part of a team designing and making models, props and costumes for a Government Education Campaign consisting of a series of TV commercials for EMA (Education Maintenance Allowance) aimed at keeping children in education. James was part of a team designing and making flame transformation effects and a dashboard time travel sequence starting from an early car all the way through into the future for their TV commercial, portraying their efforts at producing cleaner and more efficient advanced fuel. James was part of a small team designing and making props, an opening sofa and a self opening briefcase both of which had to facilitate a troop of dancing girls to come out of them, for their TV commercial. James was part of a small team designing and making a Thunderbird 1 cereal bowl, self destructing props and set for their TV commercial. The cereal bowl which had to have real cereal in it had to retract into the bowl to facilitate the launching of the Thunderbird 1 from within the bowl. James was part of a small team designing and making bubble effects and rigs for still photography and an underwater video shoot, which involved working under water with the film unit in Oceanic's dive tank for their series of six TV commercials to launch 02 as a new company. 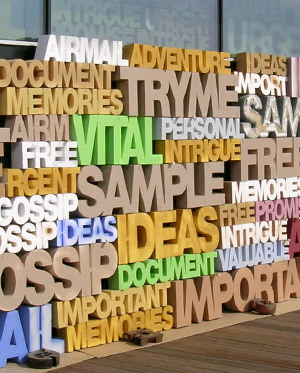 The bubbles have been in use ever since for all their promotional advertising and are well recognized. James was part of a small team designing and making a 5ft model set, large yogurt pots and coke cans to be worn as costumes to portray discarded items to be judged and then sent on to be recycled, for a German TV commercial. James was part of a team designing and making a 16m x 5m x 2m three dimensional billboard advertisement for Thames Water with four sections each with its own kinetic water feature. James was primarily responsible for the first section on the left hand side with a statue of a boy urinating into a toilet bowl. 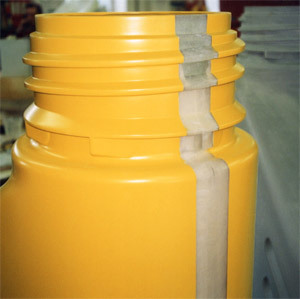 This water filled up a clear perspex cylinder with a float in it, which when it reached the top and the hand had reached the bottom of its ark it flushed the water out. The water went down pushing up three flowers from the flowerpots as if growing, this involved fairly large volumes of water. The Thames Water billboard was displayed on the Cromwell Road in London. James was part of a team designing and making a rowing machine, rigs and effects for a large chase sequence on the rowing machine for the ongoing Walkers Crisps TV commercial staring Gary Lineker and Sir Steve Redgrave. 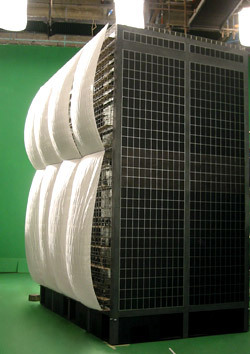 James was part of a small team designing and making a large model building for a Sony TV commercial. The apartments had groups of people in them who were all watching a football match on a Sony TV across the street in another apartment. Each apartment of people were filmed separately as a group and then added to the footage of the model building. James was part of a small team designing and making two chrome-plated body costumes for a Canon TV commercial. 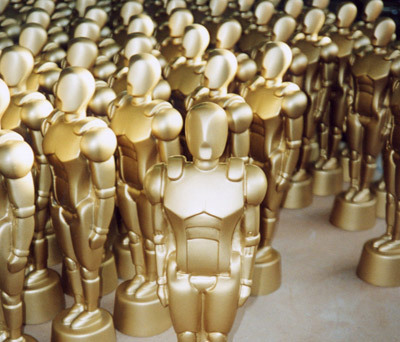 To make actors appear as metallic people, their bodies were moulded and their cast body parts, after re-sculpting, were used as vacuum forming tools. 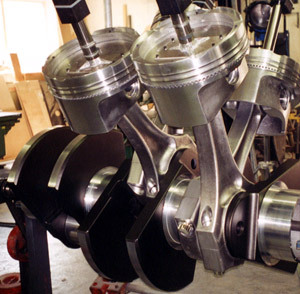 The shell body parts involved a lot of time consuming shaping and finishing as they had to be immaculate before they were chrome plated. 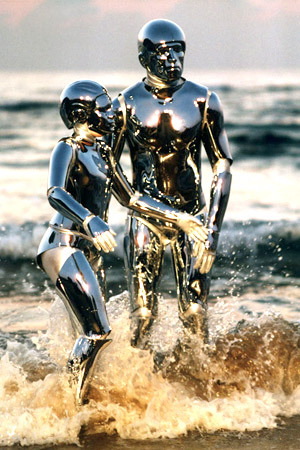 The chrome-plated costumes also had to allow free movement for the actors whilst filming on location in Italy. James was part of a team designing and making an 8m model of Noah’s Ark for an American TV commercial, where all the animals go on two by two including two Mercedes cars. 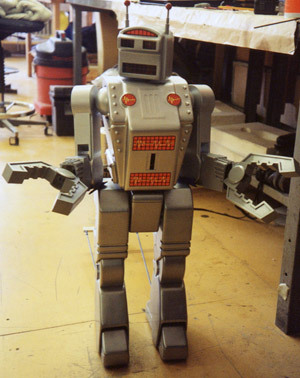 James was part of a small team designing and making an animatronic puppet toy robot for a Cheetos crisps TV commercial. James was part of a small team designing and making an animatronic duck and rigs for a Spanish Lottery TV commercial which included filming on location in Madrid. James was part of a small team designing and making animatronic heads for a bear and raccoon costumes for an Italian TV commercial, filmed on location in Milan. James was part of a small team designing and making an animatronic pig for their TV commercial. 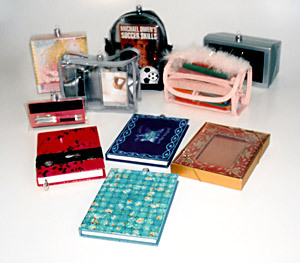 James was part of a small team designing and making hair products, chopsticks and rigs for their TV commercial. James was part of a small team designing and making a maquette of a coral set for their TV commercial. 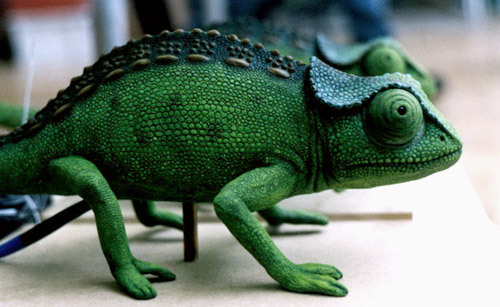 James was part of a small team designing and making animatronic chameleons for their TV commercial. 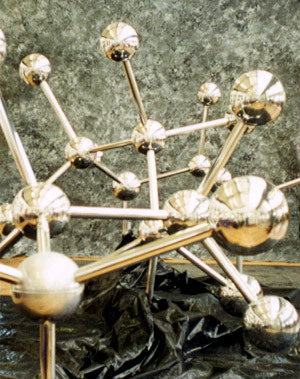 James was part of a small team designing and making a 8m chromed oil molecular structure, several 1.5m tall oil bottles, a large moving engine, with 50cm piston diameters, to show the journey of the oil through the engine for their TV commercial. 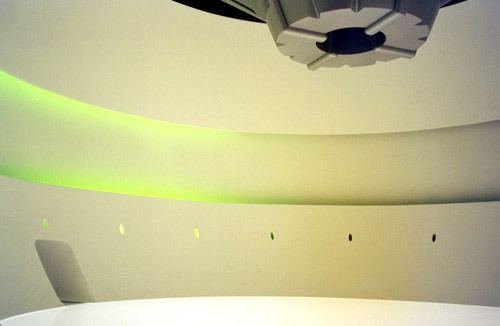 James was part of a small team designing and making a model set of a Carlsberg factory, alien space ship and alien creature for their TV commercial. James was part of a small team designing and making 100 Hertz Oscar like awards for staff performance. 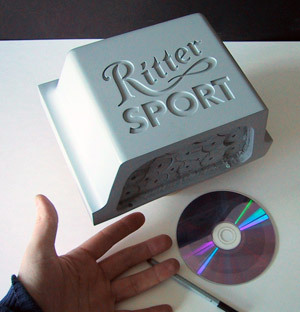 James was part of a small team designing and making a miniature set for a French Pirelli Cable billboard commercial. James was part of a small team designing and making 8ft long Kit Kat ice cream bars that were made into a jetty, with a real speed boat mored next to it and two people sitting on the jetty with their feet in the water, eating Kit Kat ice creams for a billboard commercial.